These pineapple chicken poppers are the perfect fun weeknight meal! They’re easy to make, kid-friendly, and are gluten free, paleo, whole30, and AIP compliant. I can’t get enough chicken poppers! They’re the perfect thing to make for a quick weeknight dinner or meal prep for lunch when you want an easy and delicious finger food. They’re packed with both protein and healthy vegetable based carbs, and this version features another fun flavor… pineapple! 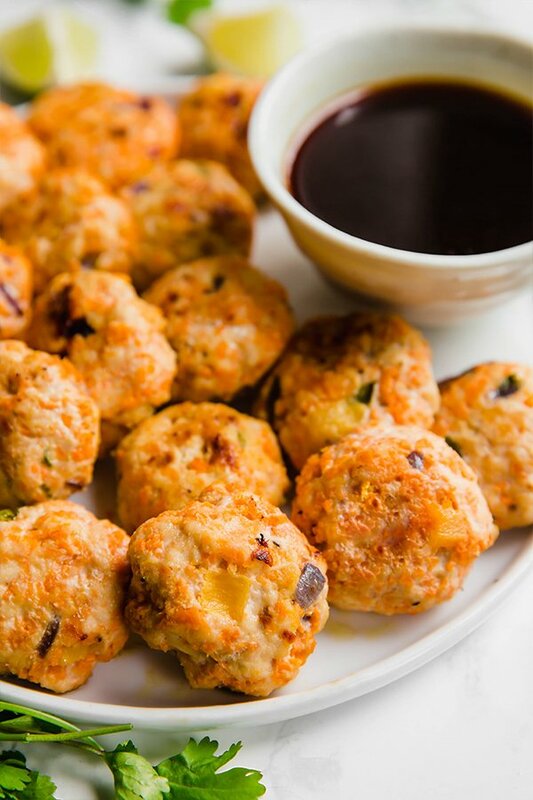 Pineapple chicken poppers are an easy and fun way to mix up your meals! They’re kid-friendly, flavorful, and can be made with easy to find ingredients. Plus, they’re gluten free, egg free, paleo, whole30 compliant, and AIP. 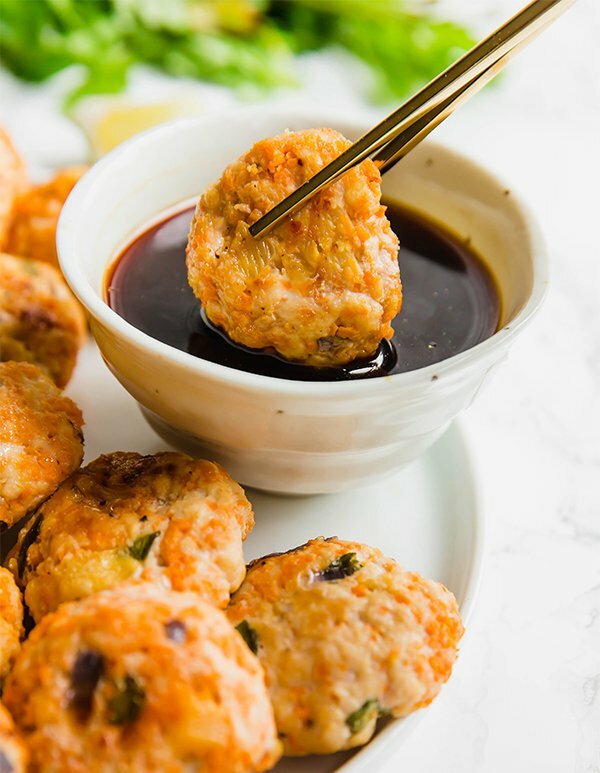 Eat these chicken poppers by themselves with the teriyaki dipping sauce, serve them with a side dish, or add them to an easy salad for a fast lunch on the go. 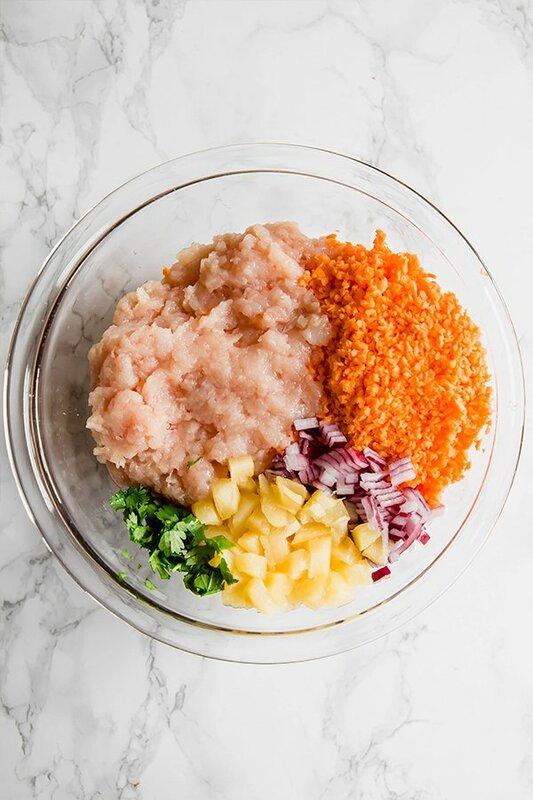 You can either buy ground chicken at the butcher counter at the store, or you can make your own with a food processor! Simply place 1 lb of chicken breast in the freezer for 15-20 minutes and then grind it in the food processor. Easy peasy! You can use orange or white sweet potato for this recipe. Recently, I’ve been enjoying using the food processor to rice the sweet potato, but you can also use a grater to grate it. You can either use fresh pineapple or canned pineapple without any added sugar. The plus of using canned pineapple is that you can also use any juice to make the teriyaki sauce. Red onion adds some nice zest, and the cilantro adds some freshness. Coconut flour helps to bind the poppers and makes them crispy. You can use other flours as a substitute. You can use either avocado oil or coconut oil to add a source of fat to the poppers. This soy sauce alternative adds just a hint of extra flavor. Using a food processor, process the sweet potato until finely riced. Alternatively, you can also use a grater to shred it. Combine the riced sweet potato with the dry ingredients and mix well until well combined. Mix in the avocado oil, lime juice and coconut aminos. Form the chicken in small, slightly flattened poppers or nuggets and place onto the baking sheet. Bake in the preheated oven for 25-28 minutes, flipping halfway through, or until the internal temperature reads 165 F on a meat thermometer. Remove from the oven and set aside to cool slightly. Using a small saucepan, whisk together all of the teriyaki sauce ingredients and set to low heat. Heat until the sauce thickens and season further to taste. Serve the poppers with teriyaki sauce and enjoy! All nutrition facts are estimations and not exact. Where is the teriyaki sauce recipe?